There are few moments in life as magical as bringing home a new puppy. I have fond memories of introducing our family dog, Kelly the Kelpie, to my children for the first time. Along with the excitement comes new challenges. No puppy is born well trained and ready to live in the home. If your new family member will live or spend time indoors one of the problems you’ll face is carpet stains and smells. This is almost always caused by the dog using the carpets as their own personal bathroom. While adorable at first this can become a nuisance once your carpet starts smelling. A smell it does! Urine smells become harder to clean and worse over time. The good news is that there’s several techniques to get your carpets looking and smelling good as new. They’ll save you time and money because you can avoid hiring a professional company every time there’s a stain. The tips below will help keep your carpets clean and odour free even when your dog has a mishap. If you’re lucky enough to catch your puppy in the act the best thing to do is act quickly. Doing so will give the best chance of removing the stain altogether. If the stain doesn’t set it’ll also stop the nasty odour from developing. Your instinct might be to give the stain a good scrub. 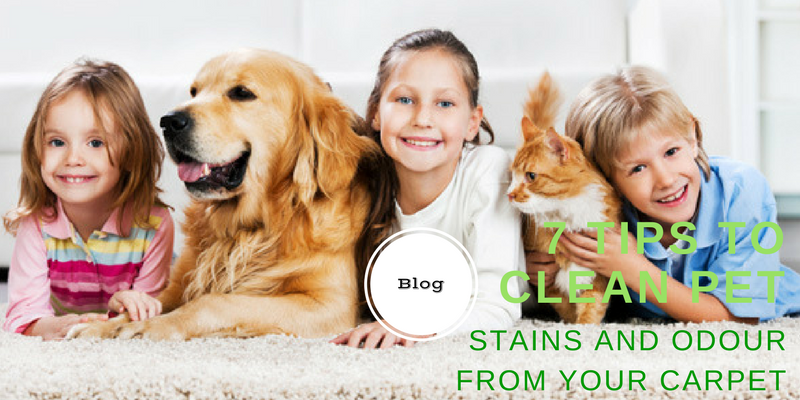 In many cases this is good practice but pet stains are a little different. Scrubbing the stain too hard will embed particles further into the carpet. Instead, use a damp cloth to lightly pat the stain. If necessary, rotate the cloth out with a clean one a regular intervals. Hot or boiling water actually reacts with the natural enzymes and proteins in the stain. This serves to physically bond the stain with fibers in the carpet. The result is a lingering stain and smell that could become impossible to remove. Instead, opt for luke warm or even cool water. It’ll do the job just fine. Sometimes you need to clean the stain after the fact and warm water simply won’t do the trick. For these occasions I recommend using a more natural product as opposed to chemical cleaners. Natural cleaners are both better for your dog and the environment. Firstly, use the damp cloth method described above and follow up with a dash or spray of vinegar. Let is set for a little while the continue to give it a light tap until the stain is removed. This step is really tied to the one above as vinegar and baking soda go hand in hand. The vinegar will help to clean the stain while the baking soda will deodorize the stain. Once you’ve applied the vinegar/water and cleaned appropriately sprinkle baking soda over the top. Wait a few hours for the solution to dry and then use a vacuum cleaner to clean up. For many pet owners odours aren’t caused by one mishap but gradually accrue overtime. In some cases the smell can be so strong you’d assume the whole carpet needs to be bleached or thrown out! However, the reality usually tells a different story. Dogs typically return to the same spots over and over again to make their mess as this is part of their territorial instincts. You need to find this spot (or spots) and isolate them so you can focus the cleaning effort here. One great tip is to buy a cheap blacklight to use in the dark. It will show you EXACTLY where all the pet stains are. The good news is that this technology is cheaper than ever and you can find a blacklight torch on eBay for less than 5 dollars. I prefer the lemon juice method because it’s completely natural, smells great and won’t harm your dag in anyway. Try a little and see if it works for your puppy. Hi There! My name is Michael Brooke and I am a dog lover, surfer and professional cleaner based in Sydney. If you want to find me online you can do so at my website at carpetcleaningsydney.com.au. I’m happy when I’m by the beach with my family beside me. I’m the proud owner of a 14 year old Kelpie named Kelly. While she isn’t as young as she used to be we wouldn’t trade her for the world.